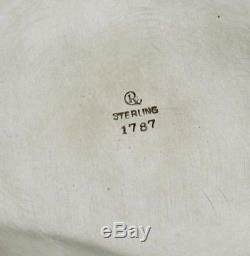 CURRIER & ROBY STERLING TEA SET c1920 " HAND CRAFTED COLONIAL RE-CREATION ". 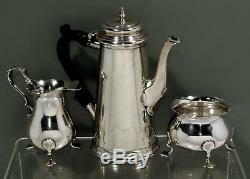 A rare turn of the century Currier and Roby sterling colonial coffee - tea service. Founded in 1900 the New York firm hand crafted re-creation of (mostly) American. Acquired by Elgin in 1940. The coffee pot in tapering lighthouse form with step bun cover. Retaining the original bell and globe finial. Original hand carved double scroll handle. Matching cream jug and sugar bowl in cauldron form. 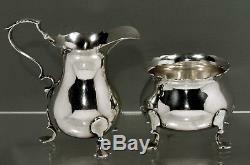 Atop tea drop cap stylized web feet. 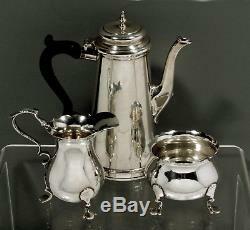 This c1920 Currier & Roby sterling colonial coffee pot is 6 3/4 inches. And the set 21 1/2 standard ounces. Cover closes flush, set stands firm on table. Original handle with even mellow surface. 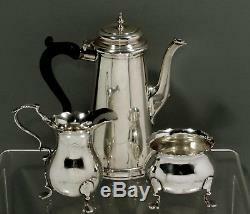 The item "Currier & Roby Sterling Tea Set c1920 AMERICAN COLONIAL RE-CREATION" is in sale since Saturday, July 21, 2018.